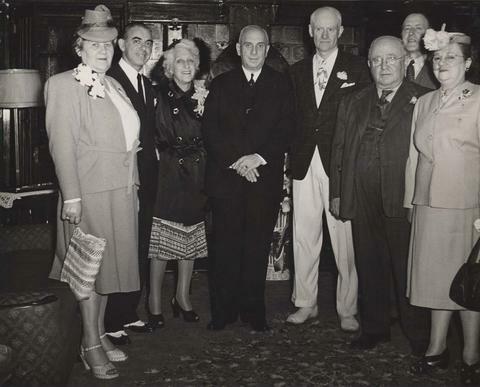 Photograph depicts (l-r) an unidentified woman, Eddie Cantor, Ida Cantor, J. Finkleman, Mr. Lexier, Mr. Groberman, Mr. Shine, and an unidentified woman. Written on the verso: "Property of J. S. Finkleman. L - R Eddie & Ida Cantor, J. Finkleman, Mr. Lexier, Groberman (member of council), Mr. Shine."